Awesome Self Stirring Mug - Who needs spoons anymore? 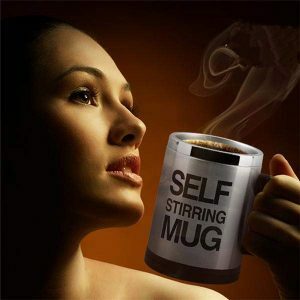 As the name suggests, the self stirring mug stirs any liquid that it is holding. All you have to do is press a button on the handle. Think about it, you’ll never have to hunt for a spoon again – just dump the sugar in your coffee and hit the button. 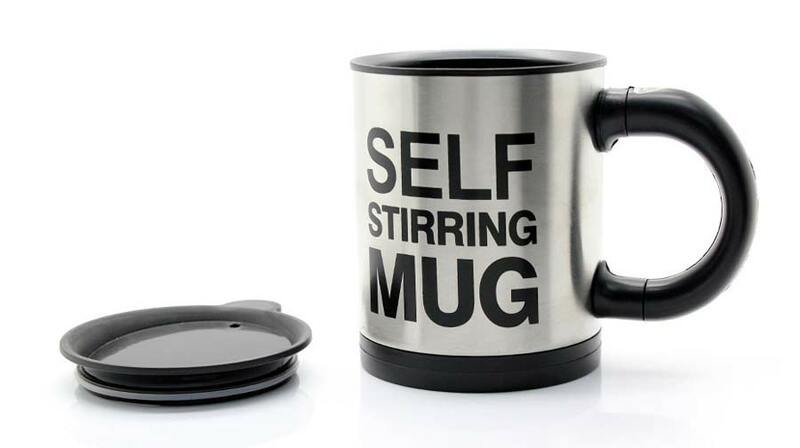 What do you use to stir your tea/coffee? A spoon? Swizzles? Tongue depressors? What! All of those so-called stirring solutions are now ancient. Spoons measure your sugar fine enough, but what a waste to have to wash (or toss) another utensil! Tongue depressors end up making your coffee taste like wood, and those stupid swizzles can’t stir anything, are you kidding? What you need is a stirring solution for your hot morning beverage that doesn’t add to landfill, or impart odd flavors to your drink while actually moving stuff around. 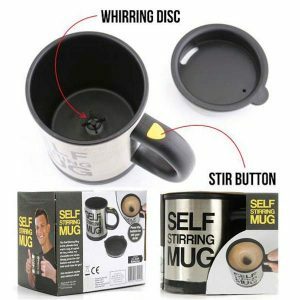 We’re genuinely enthusiastic about the Self-Stirring Mug! Stainless steel finish with a snap-lock lid keeps your drink hot. Don’t forget – inside this mug is a spinning plastic disk that frappes your drink into a whirling blended maelstrom of deliciousness. Too much? 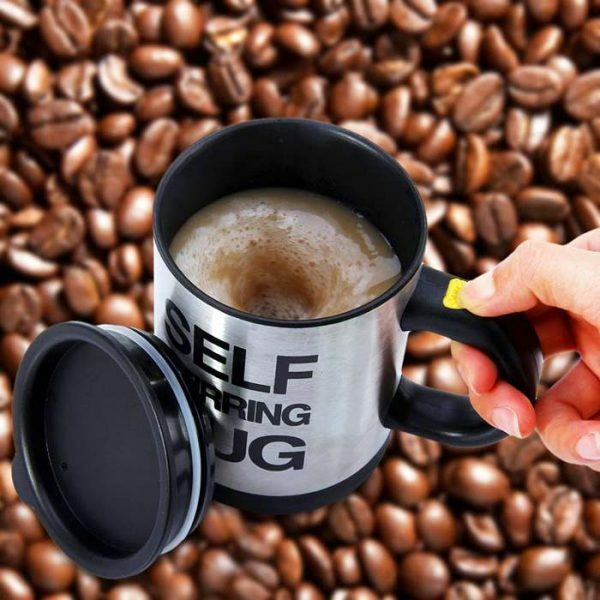 Just pop two AAA batteries inside the base, fill the mug with your favorite hot beverage, add sugar – or, maybe you just like a touch of caramel or cocoa! Whatever, just press the button on the handle and whirrr your drink into a perfect blend. No more sandy sugar in the last dregs of your drink, and no more spoons! To clean just pour in soap and press a button to stir.